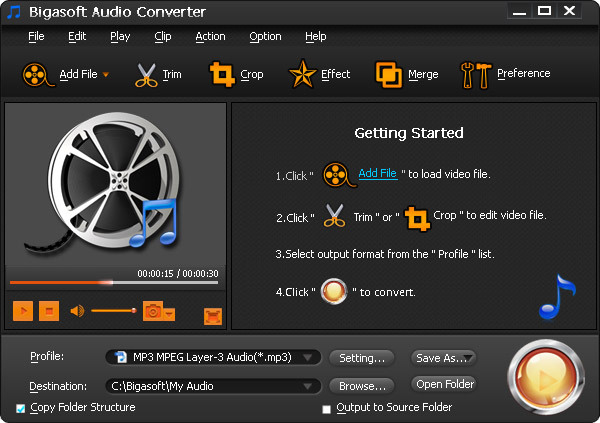 An audio converter is a kind of file converter used to convert one form of an audio file (like an MP3, WAV, WMA, etc.) into another.These are top 5 best audio converter to convert one format to another easily. Audio converters allow the users to enrich the quality of the music and helps them to enjoy it to the fullest. Moreover, the users can even change the bit rate, sampling rate and music track as per the requirement. These software’s really enhances the listening experience of the music freaks. The individual can listen to their favorite songs or audio files on any media player no matter what the file format or extension is for windows. This software converts the files that are in one format to other popular formats such as MP3, M4A, Ogg, WMA, etc. This is simple, easy to use and convert multiple files to your desired format at the same time. Key features: include compatible to convert into popular formats, easy user interface, converts audio files into any format at a faster pace and extract audio from the video files, and support on all windows operating system. This versatile software converts the audio into various popular audio formats such as WMA, WMV, MP4, OGG, WAVE, AU, etc. with ease. Moreover, you can also extract audio from the video files and change the audio segments as per your needs. Key Features : include converts audio to various formats quickly and efficiently irrespective of the source formats, extract audio streams with powerful options, compatible with windows operating system, converts illegitimate audios to the desired format, and easy to download videos from popular online video sites. This software converts the audio from one format to various different formats on your windows computer at super-fast speed. You can listen to your favorite audio files in all the devices. Key Features: include can convert the files in different formats to the desired format (MP3, FLAC, WAV, etc.) at the same time with industrial standard quality, supports on windows operating system, easy user interface, safe to use, quick conversion process, etc. This is an easy to use and free software that allows the users to convert the file in any format to the desired format and helps the users to share them on the social networking sites with their friends and acquaintances. This software not only converts the audio files in different formats, but also images, videos and other media files too. This is an open source portable software that allows the users to convert the audio from one format to another popular one with the powerful features. Moreover, you can even extract the audio files and encode them quickly. Key Features : include compatible to work on windows operating system, converts the audio files into various formats such as MP3, Ogg vorbis, FLAC, etc, encode audio files, integrated CD ripper, easy to use by novice users, can install on a Flash drive, or a portable hard drive and use it anywhere. Conclusion: These software’s help the users to convert the audio files into different formats. These software’s can even extract the audio from the video files. Moreover, users can happily download this app onto the data storage devices and use it on their computers.